Arcadia Unified School District teachers, staff, and administrators consistently keep safety training and emergency preparedness priority number one, often going well above and beyond mandated state and federal requirements. We recognize that learning is stifled if students and teachers are not in an environment in which they feel safe and secure. All throughout the school year, and even in the summer, our school sites and District office practice responding to scenarios that include but are not limited to earthquake, fire, active shooter, lockdown drills, safety training, and emergency communications planning. In addition, our District’s staff receive multiple training opportunities on topics ranging from active shooter, office and playground safety, CPR certification, and chemical hygiene training, to name a few. In total, there are 574 online trainings, in multiple languages, on a multitude of safety procedures, protocols, and practices. Below is a summary of Arcadia Unified’s safety and emergency preparedness training. Nearly 20 earthquake drills take place across the District each year. Collectively and annually, our students and staff participate in more than 85 fire drills. Our school sites engage in approximately 20 lockdown drills each school year. We partner with Arcadia Police Department to conduct Active Shooter Training at all school sites. We provide First Aid/CPR training to all teachers and staff members. Training also encompasses use of an Automated External Defibrillator (AED) and EpiPen usage. Our staff is provided Search and Rescue training on a bi-annual basis. Over the past decade, we have added security gates at every school, purchased video surveillance, visitor buzz-in control systems at schools, increased lighting, and renovated every school in the district. Though CAL OSHA requires staff assigned to handle fire extinguishers to have training, we provide training to as many staff members as possible with all of our maintenance staff and custodians being trained. Chemical Hygiene training is provided to all science teachers every two years, despite this only being required training for new staff members. We provide Injury & Illness Prevention Plan (IIPP) training to all administrators every two years, though it is only mandated to be provided for new staff. This training provides a general guideline on the proper implementation and use of the IIPP. The IIPP plan is created to assign safety responsibilities, proper compliance of safety guidelines, communication protocols, hazard assessment, accident/exposure investigation, training and instruction, and record keeping district-wide and at the school level. Incident Command training, which covers the proper use of the Standardized Emergency Management System used by all state agencies, is provided to all administrators. Every employee is trained in Child Abuse Reporting prior to the beginning of each school year, with administrators being trained on Child Abuse Prevention. Routine safety inspections of school classrooms and facilities are conducted frequently, including inspections by the Fire Marshall. We have Safety Committees at each school site which hold frequent meetings to discuss trends, best practices, and discuss ways to effectively ensure the safety of our students and staff. Many staff and parents volunteer their time on these committees. Arcadia Unified has participated in the Great California Shakeout Drill every year since its inception in 2008. During this drill, all schools and the District office simulate a disaster and practices their emergency preparedness plans and then hold an assessment meeting to evaluate. Created an emergency hotline for a backup communication if needed. (626) 821-1783. 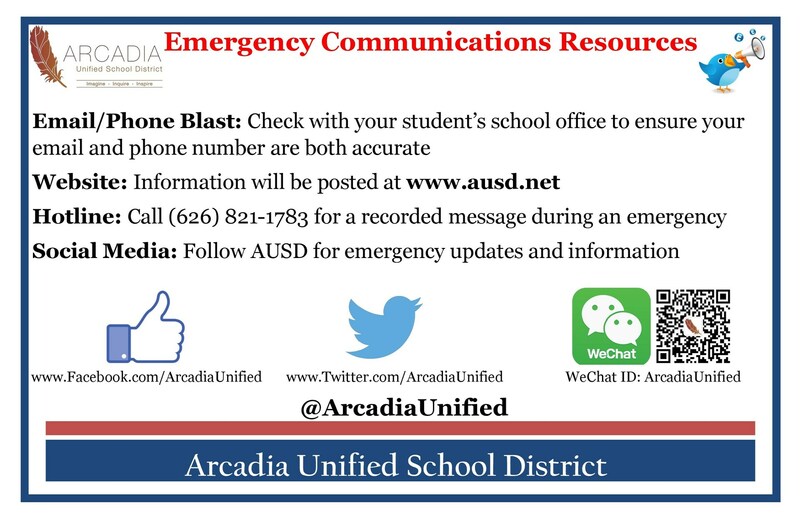 Thanks to the Arcadia Educational Foundation, we have access to a district-wide communication system, SchoolMessenger, which houses contact information for every student and staff member, enabling us the ability to send an email or phone call blast immediately during an emergency to all students, staff, and parents. In times of emergency, parents and the community can call Arcadia Unified’s Emergency Hotline: (626) 821-1783. Arcadia High School has an anonymous tip hotline that community members, students, and parents can call to report incidents and/or suspicious activity: (626) 821-4682. Different schools have varying options for reporting possible incidents and bullying. You can also call your school directly to report incidents, or you may call the District office (626) 821-8300 during business hours. Call the Arcadia Police Department (626) 574-5150 or dial 911 during an emergency. Parents, please ensure you have your correct phone number and email address on file at your student’s school office to ensure you are receiving important messages from your school and district. We also encourage families and community partners to “Like” and “Follow” our social media pages, as Twitter and Facebook serve as quick and efficient methods to share emergency communication with our community. We need your support. We as a school district alone do not have all the answers. All aspects of our community need to help us and everyone within our Arcadia community. No one group can do this important safety work in isolation. We need parents, students, staff, community leaders, and residents to come together.